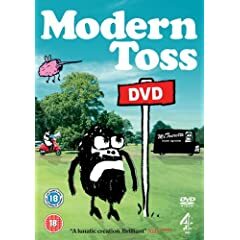 I was asked by the Editor of The Jester (the Cartoonists’ Club newsletter, which I edited until the end of last year) to write a review of the TV series Modern Toss. So I did. Private Eye readers may remember when, a few years ago, cartoons started appearing in the magazine by someone called “Link”. These caused some grumbling in the cartooning community because they were, frankly, baffling. It wasn’t just the fact they were drawn in a naïve, scrawly style, that got people’s backs up, but the fact that no one could see what the joke was. I recall one featured someone with a profusion of nose hair saying, “I’m having a bad nose hair day” … nope, still doesn’t do it for me. Shortly afterwards, a magazine called Modern Toss appeared, filled with cartoons by Link, who we now knew to be Jon Link, and his cohort Mick Bunnage. Here the odball ideas were fleshed out to strips as well as spot cartoons. These were pretty juvenile and largely based on elaborate swearing (especially “Mr Tourette – Master Signwriter”) but they were more successful than the spot gags. Although there was still an “Emperor’s new clothes” feel, there were chuckles to be had. Now you can experience Modern Toss on the telly, its second series appearing in the wee small hours of Thursday morning on – where else? – Channel 4. It features animations, live-action sketches and a mix of the two. So you get real scenes populated by characters that look like doodles drawn while on the phone. The look of the magazine is reproduced faithfully and the end result is a TV series that’s hit and miss but pretty funny in places. And it’s certainly one of a kind! Most of the sketches put you in mind of the kind of daft things that people pass around by email. In fact, the internet is probably the natural home of this show. If you do a search for Modern Toss on You Tube you can see lots of the sketches there. Just make sure the f***ing nippers aren’t around, yeah?